Tivoli Tours & Villa D’Este Tours Include: Our customized day trips from Rome includes private driving guide, roundtrip private door-to-door transportation, taxes, tolls and parking. Not Included: Entrance fees to sites. Expert local guide available for an additional fee. This privately guided day tour of the historic hilltown of Tivoli features a tour of both Villa D’Este and Villa Adriana. After a 45-minute drive from Rome, you will reach Villa Adriana, whose construction began in 118 AD. This villa is thought to be the largest of its kind built in antiquity. Visitors with a keen interest in the villa’s archaeology can rent an audio guide at the villa, or hire an expert local guide to accompany you. Your guided tour here lasts about two hours, after which your excursion continues to Tivoli. Lunch here is suggested in a typical local restaurant named Ristorante Sibilla, located near Villa Gregoriana, another incredible site, whose park contains a waterfall sourced from the Aniene River. What makes this old world restaurant such a favorite—besides, of course, the good food– is the Roman Temple dedicated to the goddess Sybille, located right in the restaurant garden. After lunch you will enjoy a brief drive through the ancient town to reach Villa D’Este, known for the beauty of its magnificent gardens and fountains. This was the Renaissance residence of Cardinal Ippolito d’Este in the mid 1500s; the playful fountains and “water games” here were created from the plans of such famous artists and architects as Bernini and Pirro Ligorio. 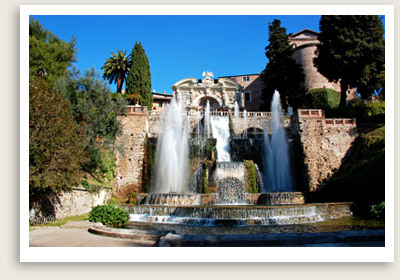 Your private tour guide will take you on a brief stroll in Tivoli’s historical center before returning to Rome.